Packed with insightful interviews, Shift Ahead offers a smart, calculated approach to knowing when to change course and how to pull it off. In a world that's changing faster and more furiously than ever, the ability to shift focus is critical. Why is it that some organizations can continually evolve to meet the times and the marketplace, and others can't? How do some businesses recognize the right moment to shift, and others, ruefully, only after it's too late? 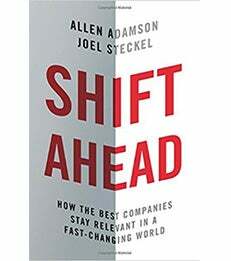 Packed with insightful interviews, Shift Ahead by Professors Allen Adamson and Joel Steckel offers a smart, calculated approach to knowing when to change course and how to pull it off.